I have started to do the Missile launcher sponson, This will beable to move up and down. In the carnival I will not move it much, but the option is there if needed. Start of the Missile launcher sponson. Support 10mmx10mm battons on. 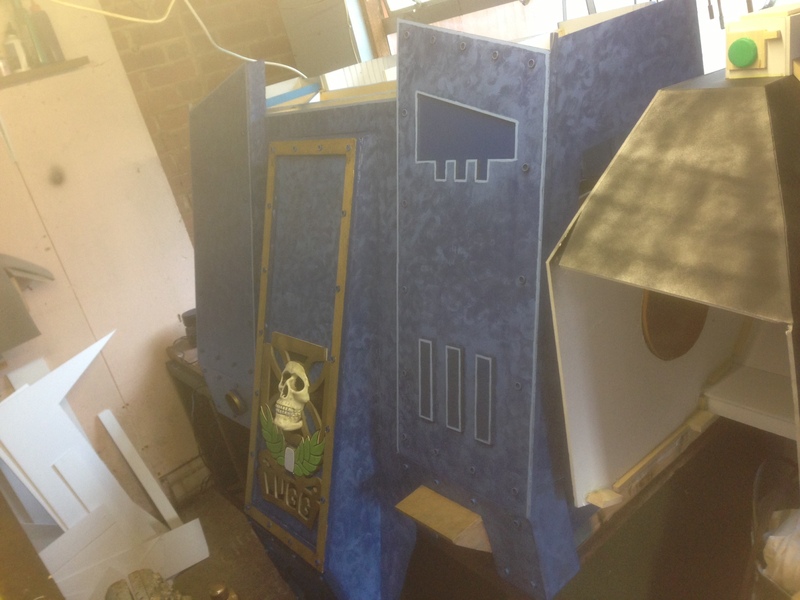 Rear of the dreadnought has had a coat of blue basecoat. 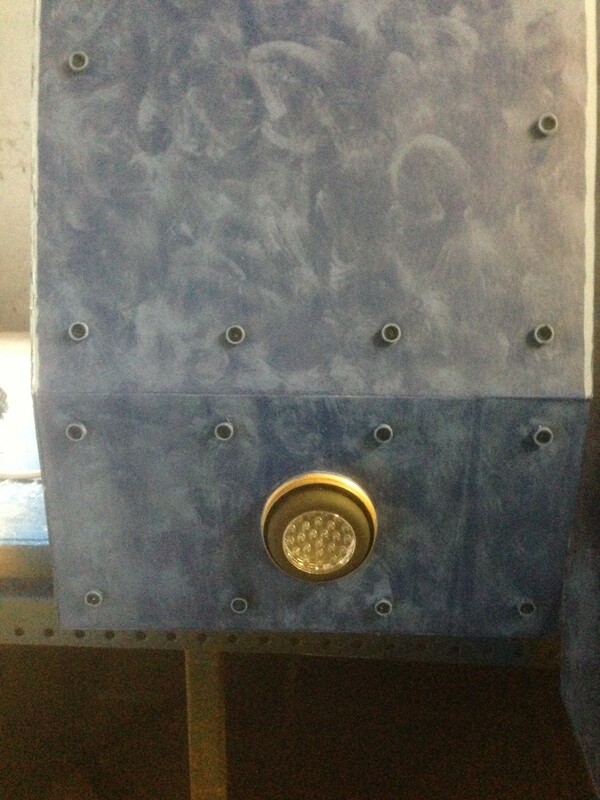 As I am building the missile launcher sponson I thought I would show you the speakers in a bit more detail. There will be eight on the missile launcher and 2 near the assault cannon on the other side of the costume. Extra base speakers x 2 more expensive. Its Saturday and more time spent on the project, Dry brushed the rear of the dreadnought and glazed it to bring the colours together more. in a dusty enviroment where explosions have been going off near by and falling buildings so its not going to be clean looking. There is only war. It also gives it more life and is easier to see in the darkness of the carnival. I also have been working on one of the insignias that will go onto the costume, Pictures below. mounting board was used to make the insignia. 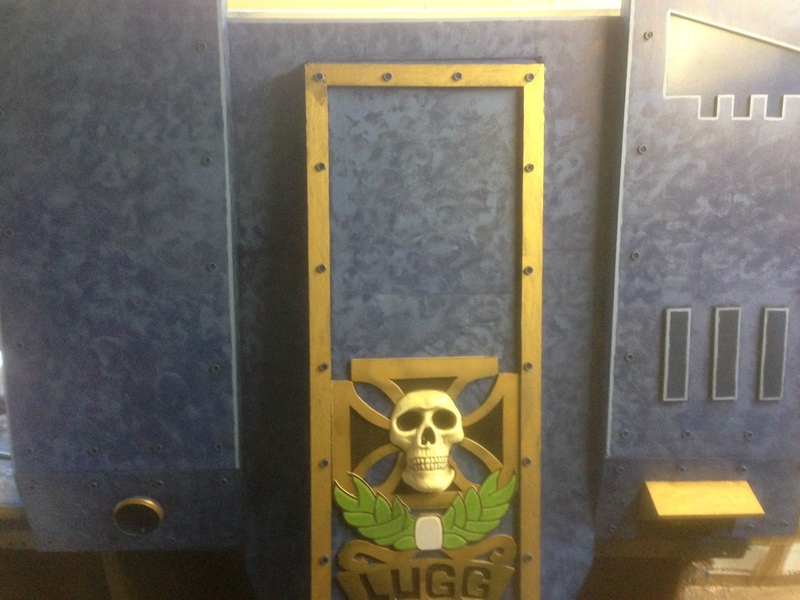 Now has been sprayed gold, This will go onto the back of the dreadnought. Blue drybrush is put on to give depth and battle worn look, dreads are relics and have been about for a while. Time to put on the glaze to bring the colours closer together. Galze added, its hard to see here but the colours are closer together and a haze of shine too. As you can see it adds more character to the costume, Looks like a giant figure you would paint. The effect looks cool from a distance where the crowd are going to be in the carnival. That is really amazing. Looks great. How long have you been working on this stuff? When are you thinking it will be completed? Apologies if I missed it somewhere. My goal is to Complete 5 costumes by mid June. Sunday morning, So got some time before I go to a poker tournament. If I get knocked out early I will do some more. I did some work on the rear of the dreadnought and on the missile launcher sponson. Now the glaze is fully dry, It looks just how I wanted with a two tone effect giving it life. Gold eagle now on. Tonight I got home from work had a bit to eat and started work on the dreadnought costume. going with the plan of making it look like a giant painted figure that we all know. Highlighted and fitted the black airflow ducts. I thinks it looks alot better now. Top view. Misslie launcer sponson coming together. Bottom view , not finished yet. Got home from work , had some food then started work on detailing the front of the dreadnought and building the targeter for the missile launcher. Assault cannon side has had some detailing done. Missile launcher plate has also had some detailing done. Centre has had some gold done. Not looking so blue now, coming to life slowly. Did some work to the missile launcher again. Targeter added to the missile launcher. thinking weather to put a speaker or a light in this spot. more thought needed here. Another Photo of the progress so far. Last edited by plugg; 01-19-13 at 07:20 AM. The dreadnought has come on alot and is on the dakka dakka forums.